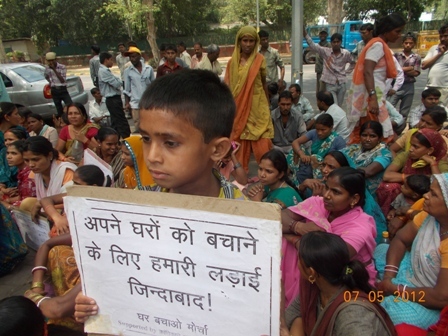 On 7th May 2012, following the renewed threat of massive slum demolition in Gayatri Colony (near Baljeet Nagar/Anand Parbat industrial area) by the Delhi Development Authority (DDA), hundreds of slum dwellers gathered outside the Chief Minister’s residence in protest. Seeing this as a problem that affects slum dwellers across the board, women and children from across different slum/JJ colonies (Pandav Nagar, Hem Nagar, Nehru Nagar, Punjabi Basti, Gayatri Colony, etc.) 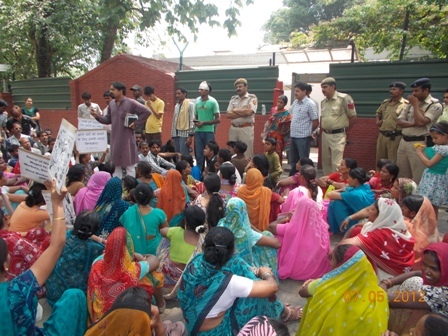 gathered outside Sheila Dixit’s residence. 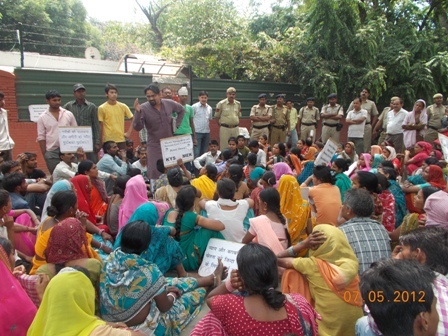 The agitated slum dwellers sought to bring to the CM’s immediate attention the plight of the thousands of impoverished workers and their families residing in slums. The agitation was carried out under the banner of the Ghar Bachao Morcha, a body formed by the slum dwellers last year itself. After a day-long protest, the Chief Minister finally met a four member delegation. On hearing the arguments with respect to the arbitrary nature of the 1998 cut-off date, the CM assured that the slum demolition will stop, and that proper discussion on the issue will take place. She assured the slum dwellers’ representatives that her government will further look into the matter of the cut-off date. Since the beginning of their agitation, the slum dwellers have highlighted how the slum settlements across Delhi house lakhs of poor, working class people. Most of the men in these slums work in factories/sweatshops or as rickshaw-pullers, contract workers in the MCD, vendors, etc. The women work as maid-servants in people’s homes or participate in the informal sector of the economy. However, despite their important role in the socio-economic fabric of this city, slum dwellers are treated with little respect and are made to feel as if their lives have no value. Indeed, rather than recognizing the value of their economic contribution to the city’s economy, the Government’s approach is characterized by slum demolition which is accompanied by minimal relocation and rehabilitation. Whenever slum demolitions take place, most of the families are identified as “ineligible” for rehabilitation due to the cut-off date of 1998. The few families that are considered “eligible” for rehabilitation are moved to underdeveloped settlements in far flung off and poorly connected parts the city, causing massive social and financial dislocation of affected families. Ironically, many a times the land from which slum settlements are razed is left vacant (often with the rubble of the erstwhile slum still lying around)—a fact which indicates that more than providing alternative housing for the poor, ‘hiding of the poor’ is what characterizes the DDA’s policy vis-à-vis squatter settlements. Activists of Ghar Bachao Morcha claim that the DDA’s own records reveal just how dismissive the urban authorities are with respect to the most vulnerable section of the city’ population. For example, in a study commissioned by the DDA to the Association of Urban Management and Development Authorities in 2003, what is clearly reported is the continuous unwillingness to meet estimated targets for low income housing—a troubling policy approach which has led to a situation where an estimated 3 million people (about 27% of the total urban population) is forced to occupy less than 3% of the residential area in the city! In fact, with the arbitrarily fixed cut-off date of 1998, the urban development authorities find it easy to demolish slums with minimal relocation and rehabilitation plans. On the one hand, the Government and urban development authorities refuse to implement land sealing under the Urban Land (Sealing & Regulation) Act, and on the other hand, they arbitrarily decide that people who come to the city after a certain date are “ineligible” to actually live in the city they work in. The slum dwellers also pointed to the past record of DDA’s slum-clearance clearly shows that lands from which slum dwellers are evicted are mostly used for construction of malls or high-rise residential complexes which only the rich can afford. This, they argued was most unfortunate, considering that the DDA is supposed to cater to the needs of all strata of society. However, in reality very little of DDA’s finances are spent on housing projects for the poor. Quite expectedly then, the city’s slum dwellers are questioning the rationale of an urban development plan that excludes a very large portion of the city’s working population. The question is can urban authorities even claim that shopping malls and high-rise residential complexes are projects implemented for “larger public interest”, and are hence, projects that legitimately require urgent slum demolition. 10. Before pursuing demolition the DDA should make use of proper consultation mechanisms, and should use all measures to take the slum dwellers into confidence.